My best friend Emily has a little bit of an obsession with owls! We all aren't sure why, we don't know whether it's because they're cute and fluffy...but we love her anyway and we encourage her obsession. It was her birthday back in February (yes, a few months overdue but better late than never!) 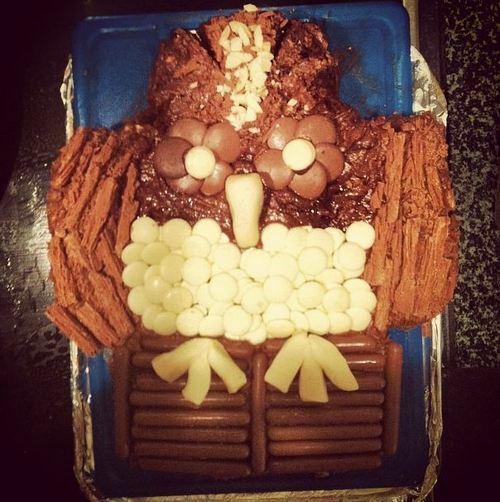 and we agreed this year not to spend too much, so instead, I made her an owl cake. It was VERY fiddly, it took me and 3 and a half hour to get it right (well not really 'right', it's still not brilliant) but she absolutely loved it! I adapted it from this recipe and rather than write exactly how I did it step by step, have a look at the original version - it will be much clearer and better explained than I could get across to you. Have a go for yourselves! I'm going to try and make a cat cake soon for my best friends birthday coming up next month. I shall report back; hopefully with good news!